There has been a shooting at the University of California at Los Angeles, university officials confirmed. The shooting occurred in the school’s Engineering 4 building, according to the campus alert system. Two males are dead in a murder-suicide. The Los Angeles Police Department said that the two victims were men who were found dead inside the engineering building. “It is certainly possible that one of the victims is the shooter, but we don’t know that,” UCLA Police Chief James Herren told reporters at a press conference. In a later statement, LA Police Chief Charlie Beck confirmed to the reporters that the one of the dead men was the shooter, who killed himself and another man in a murder-suicide. He said that the campus should be considered safe. "The campus is now safe," Beck said. Police arrived on the scene around 10:00 a.m. local time. University officials told students observe a campus-wide lockdown. The shooter was described as a white male standing at about 6 feet tall, according to the Daily Bruin, a UCLA student newspaper. Police reported that the shooter is wearing a black jacket and black pants. Aerial video showed several ambulances on campus, and at least one person could be seen being loaded into an ambulance on a stretcher. It is not clear if the shooter remains at large. A SWAT team could be seen doing a sweep of the campus, going from building to building and door to door in search of the shooter, however. The Los Angeles Police Department was put on a city-wide tactical alert. Agents from the FBI and the Bureau of Alcohol, Tobacco, Firearms and Explosives (ATF) are at the scene. 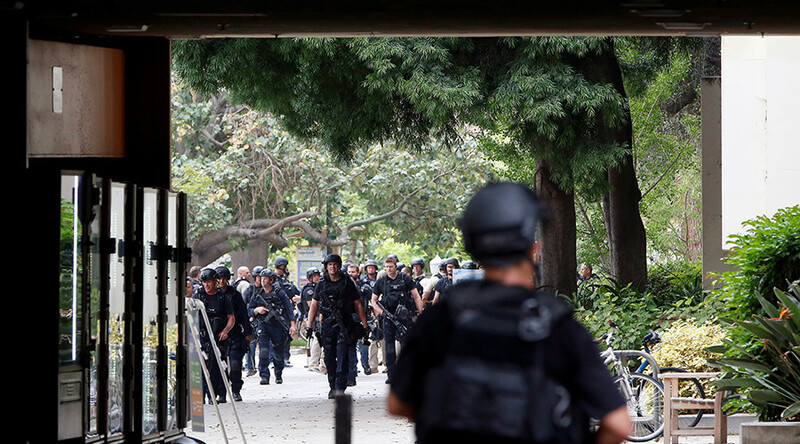 Several schools surrounding the UCLA campus have been placed on lockdown as well. With more than 43,000 students, UCLA is the largest campus of the University of California system in terms of enrollment. The 419-acre campus is located in the Westwood Village neighborhood of Los Angeles. It was founded in 1919. Notable alumni include baseball player Jackie Robinson, current US Representative Judy Chu and former Rep. Harry Waxman, New York Senator Kirsten Gillibrand, and a slew of stars in the entertainment industry. Although the lockdown was lifted around noon local time, the day's classes and exams remained cancelled.